The 1945 stamps feature the statue of Peter Pan in Kensington Gardens, London. Peter Pan was chosen for its connotations of immortal youth. Designed and issued just a few months after the end of the Second World War, the stamps reflect a romantic image far removed from the reality of heavily bombed London. 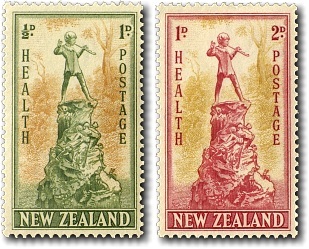 The stamps were designed by James Berry, himself an expatriate Londoner, who sent regular food parcels from New Zealand to friends and family throughout the war. Kensington Gardens were laid out around 1728-1738 as the private gardens of Kensington Palace. Long after they had been opened to the public, the King asked his Prime Minister the possible cost of enclosing them again - the answer was "a Crown". Kensington Gardens is now most famous as the setting of J.M. Barrie's Peter Pan books and stage play. In 1912 Barrie paid Sir George Frampton, a renowned sculptor and one of the original eight members of the British School of Sculpture to create the bronze statue.